As it turns out, that recipe doesn’t involve a roux, but since when has that stopped me? I was a man obsessed, and I wanted a nice dark roux. And as long as we were doing a culinary mashup I decided I’d take the Messy Baker’s idea of grated carrot and up it into a full French mirepoix. So for those taking notes on your fusion-cuisine scorecards, that’s a base recipe from a Canadian woman using pan-East Asian flavors, with a Cajun thickening technique and a French vegetable base. You can see where the naming got a little fuzzy. But wait, let’s take a little break here and talk terminology, since I’ve lobbed a couple technical terms out there. 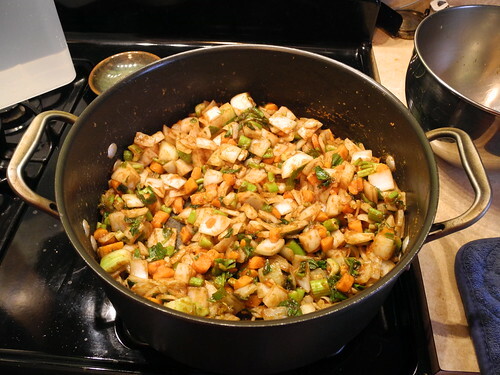 First, the easy one: ‘mirepoix’ (say: meer-pwah) is a mixture of chopped onion, carrot, and celery. Totally classic, and simple enough. A little wilder, though, is ‘roux’ (say: roo), a mixture of flour and fat, whose purpose is to thicken a liquid. In French cookery, you see this mainly in sauces. If you’ve ever melted butter, cooked flour in it briefly, and then stirred in some milk to thicken, congratulations! You used a roux to make a béchamel sauce! (Or its American cousin, cream gravy.) Speaking of gravy, if you’ve cooked flour in the drippings from a piece of meat, whisked in stock, and poured the result over mashed potatoes? That’s a roux, too. The French cook their roux very briefly, so that it barely takes on any color, but when you get into Cajun cooking all bets are off. That roux might be a light tan, or peanut butter, or copper-penny, or chocolate, or even just this side of black. It’s a totally different beast, with great nutty, roasty flavors, and that’s the flavor I was longing for in this soup. But enough about the background: you want to know what it tastes like. Heaven: it tastes like heaven, assuming that heaven tastes like a light-but-filling chicken soup with rich flavors and a riot of textures, which seems plausible. 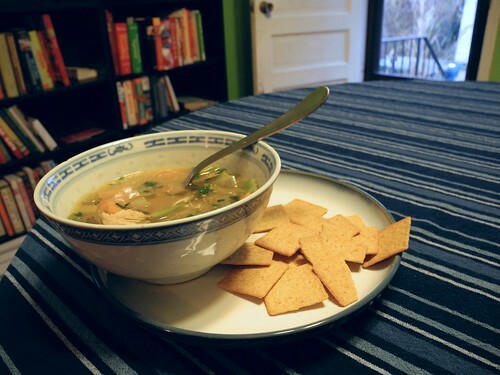 I made this soup for a potluck (the same potluck as the smoky lentil soup; I’ve been sitting on the recipe a while), and it went over very, very well. I and a few coworkers ended up just sitting on a couch near the crockpot ladling out “just a little more” for a good thirty minutes until it was all gone. 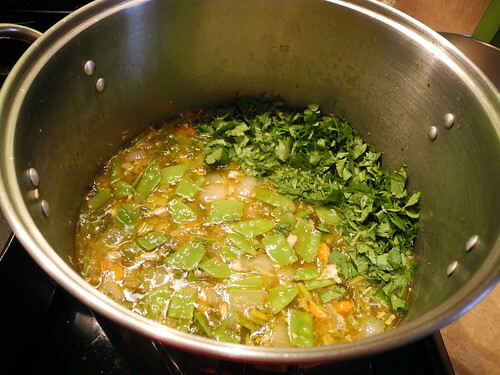 I made 7 quarts of this soup (twice the quantity below), expecting to take some home… but not a drop was left. Whisk together the flour and oil in a large stockpot (a wide pot is easier to work in that a tall one). Heat the oil and flour over medium to medium-high heat to cook the roux. Cook, stirring constantly, until the roux turns a rich peanut-butter brown, 15 minutes or so. 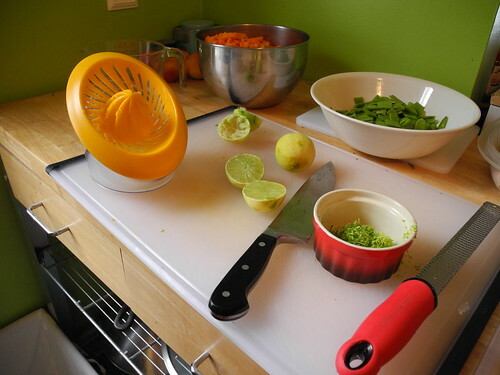 Immediately add the onion, carrot, and celery and saute until the onion is softened and translucent, about 5 minutes. Add the stock slowly, stirring to dissolve the roux in the liquid. Add the ginger, garlic, fish sauce, brown sugar, lime juice, lime zest, and serrano peppers and bring to a boil. Add the chicken and quinoa and return to a boil, then reduce the heat and simmer until quinoa is almost cooked, about 15 minutes. 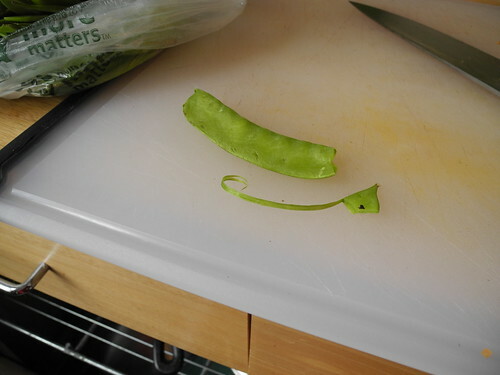 Add snowpeas and cook until they’ve soften softened slightly, 3-5 minutes. Add cilantro, stir, and remove from heat. Taste for good seasoning balance, especially salt and lime, and adjust if necessary. (If you used a salty stock, you may not need to adjust anything.) Serve hot. In Cajun cooking, a roux is sometimes ruefully called ‘kitchen napalm’. It’s a joke, yes, but one rooted in reality: that stuff is HOT, and it sticks to skin like nobody’s business. The roux needs to be stirred constantly, and the higher the heat goes the faster it needs to be stirred so it doesn’t burn. (The only thing to do with a burnt roux is throw it out; you can’t save it.) If you’re getting scared about burning the roux or splashing yourself, you can always turn down the heat. It’ll take a little longer to cook, but it’ll get there eventually. 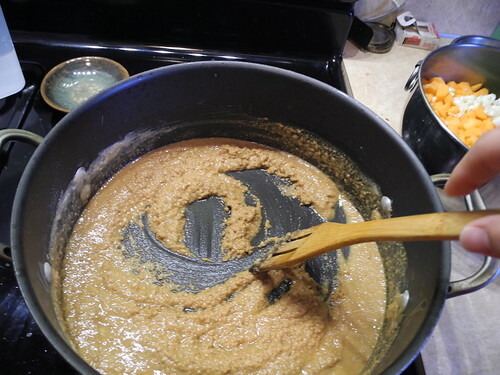 You can also cook the roux to a lighter color, in which case the flavor will be less nutty and roasty. 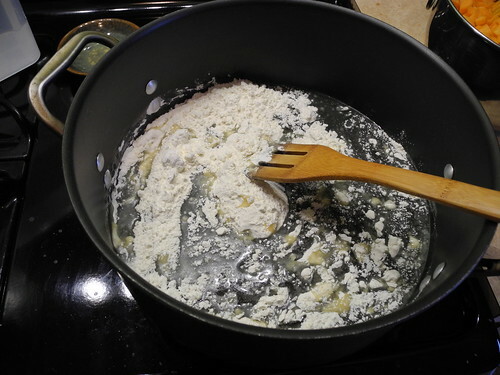 Reduce the flour and oil amounts to a quarter-cup each in that case; light roux has more thickening power than dark roux. Post-Thanksgiving bonus: still have leftover turkey cluttering up your fridge or freezer? It will definitely work here. Fish sauce is a clear brown liquid made of fermented salted fish; it’s salty, pungent, and delicious. There are many varieties produced throughout East Asia, any of which would work here; you can buy fish sauce in Asian markets and in some grocery stores. If you can’t find it (or would prefer not to use it for whatever reason), you could add more salt and a splash of Worcestershire sauce. The flavor will be different, but good. You can swap out the serranos pretty freely — jalapeños are an easy 1:1 swap, but any hot pepper should work. Just be cognizant of their relative spice. Delicious! A nice hearty comforting soup, but still light.